Don’t tell me that I didn’t warn you, but the photos you are going to see will make you want to get on the next plane to Pieria. 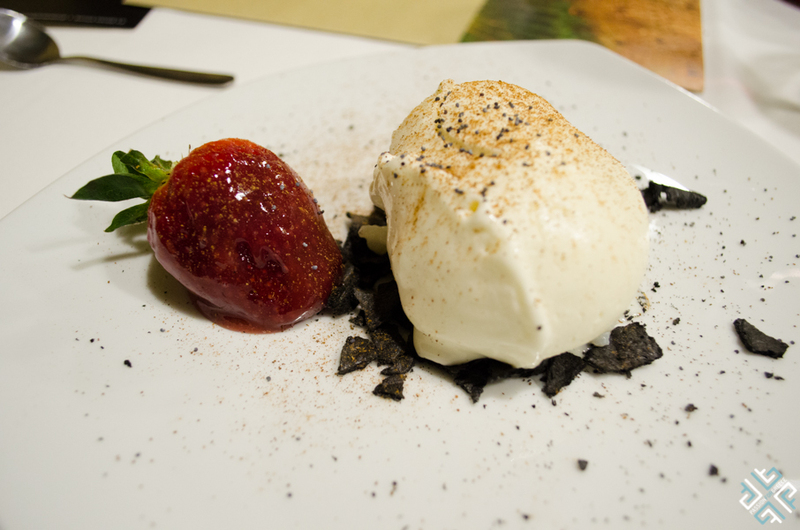 Let me take you inside Pieria’s mouthwatering food scene, but before we go deep into the gastronomic discussions let me first tell you where Pieria is. Pieria is located in the southern part of Macedonia and is the capital of Katerini. When the Chamber of Pieria extended an invitation for us to visit the region, myself and three of my fellow travel bloggers of Travel Bloggers Greece made our arrangements and off we went on a weekend to explore the region of Katerini. Pieria is a coastal city stretching over 70 kilometres, with abundant golden sand beaches and crystal clear water. Apparently the region exports substantial amounts of mussels to France and during our walks on the beach we noticed many seashells and mussel shells which were abandoned by their previous tenants. Pieria has a fantastic offering of seafood dishes which we got to savour during our weekend escape. 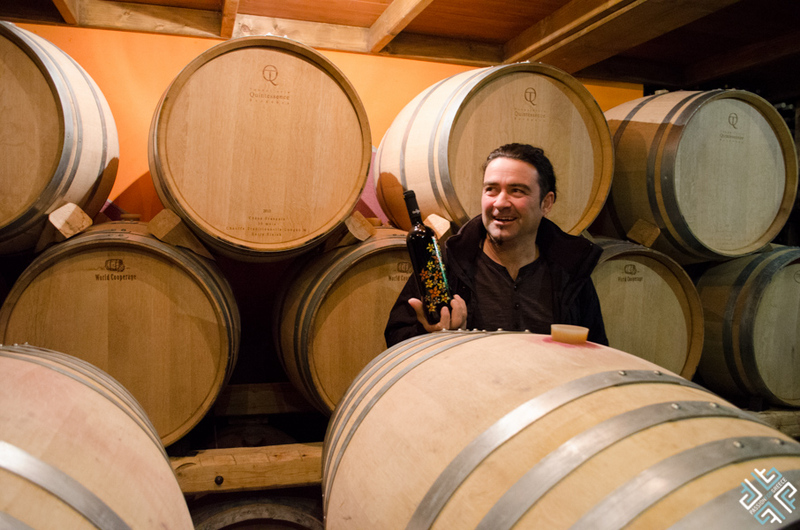 The wines of the region of Macedonia should be complimented too and before we get to the gastronomic delights let me take you to the winery of Kourtis. 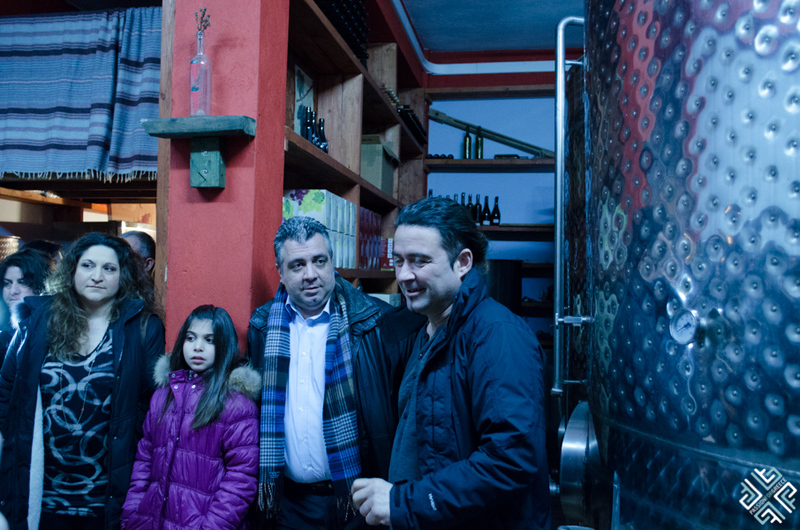 On our first evening in Pieria we went to visit a small local winery which belongs to the Kourtis family. The winery is located in a village called Rachi which is located on an altitude of 300 meters between Mount Olympus and Mount Pierus. The region is known for its cherry cultivation, a lot of which is exported to Russia. The first vines were planted in 1997 and the first wine production began in 2008. The grape varieties which are cultivated at the estate are Chardonnay, Trebbiano, Syrah, Merlot, Cabernet Sauvignon, as well as the Greek varieties Assyrtiko, Vidiano, Xinomavro and Agiorgitiko. 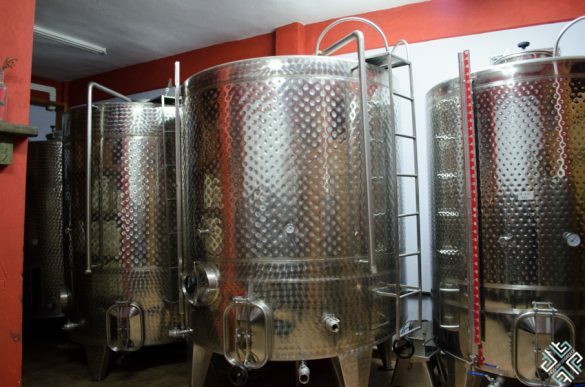 The Kourtis winery produces approximately 20,000 litres of wine per year, the wines are biological and can be found in selected wine stores all over Greece as well as in a selection of restaurants in Germany, Italy and Switzerland. 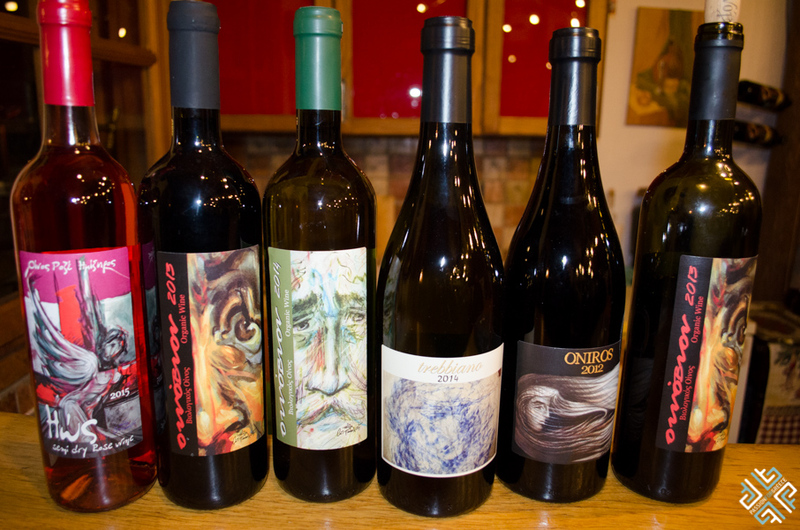 The Kourtis wines have also been awarded with numerous awards at wine competitions in Berlin and Thessaloniki. The Oinovion Ktima Kourti red wine was recently awarded with a gold medal at the Berliner Wine Trophy 2016. After Apostolos Kourtis the owner of the winery completed the tour where he also showed us some of the bottles which were hand-painted by his sister, we had a private wine tasting. 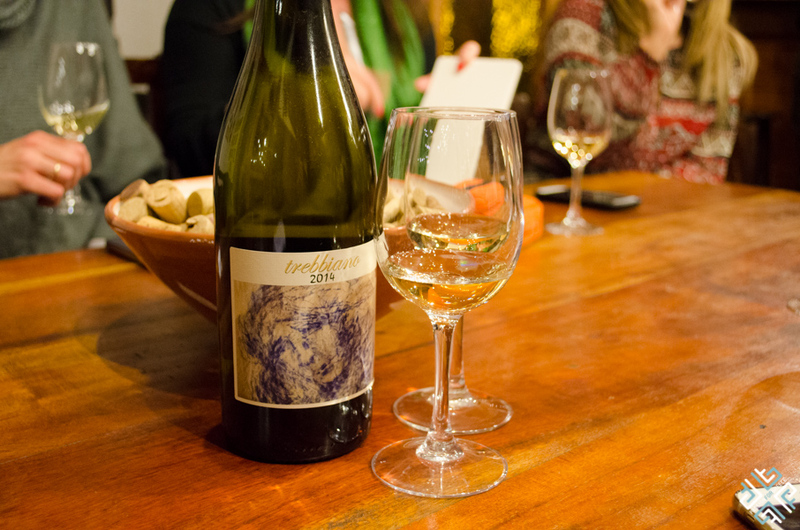 We first tried a very fine white wine called the Trebbiano 2014, which is aged in oak barrels for 6 months. We then had a delicious semi dry Rose wine called Ios, 80% Xixomavro grape variety and 20% Syrah. 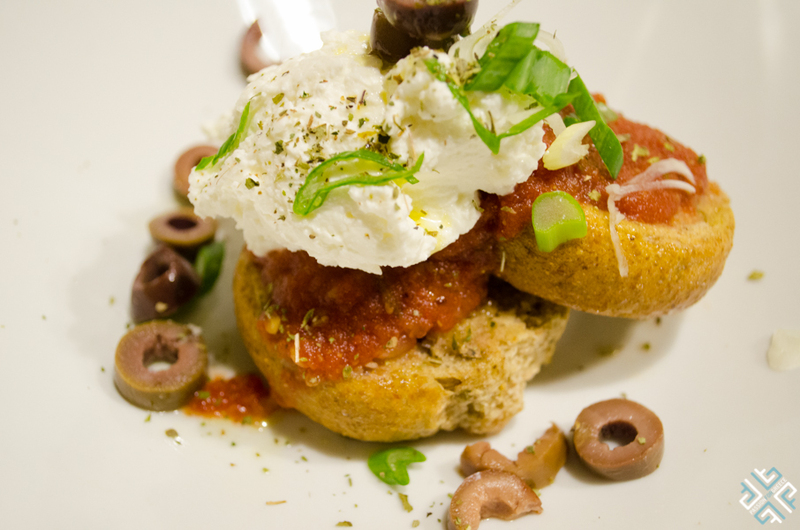 Once we tasted the fine wines of the Kourtis winery we then went to savour the local gastronomic delicacies at a restaurant called Boukia & Goulia which translates as Bite and Sip. We had many delicious bites and plenty of sips at this traditional restaurant located in the city centre of Pieria. 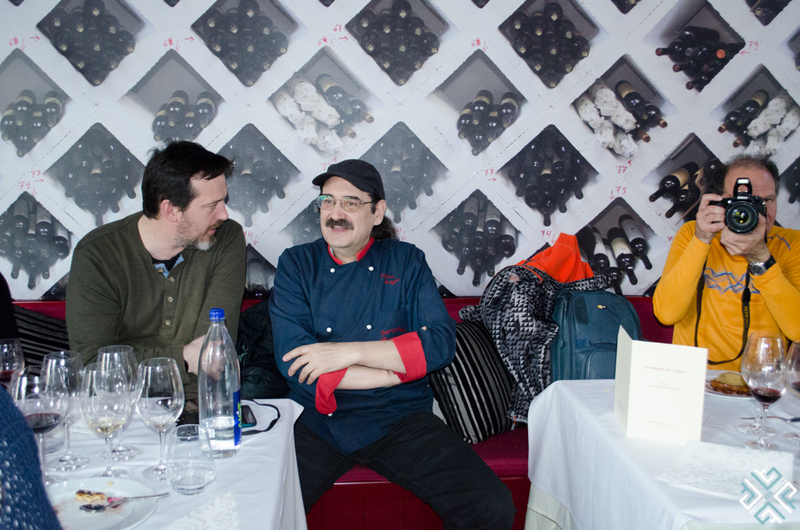 Our menu was prepared by the talented Chef Thanassis Kontses. 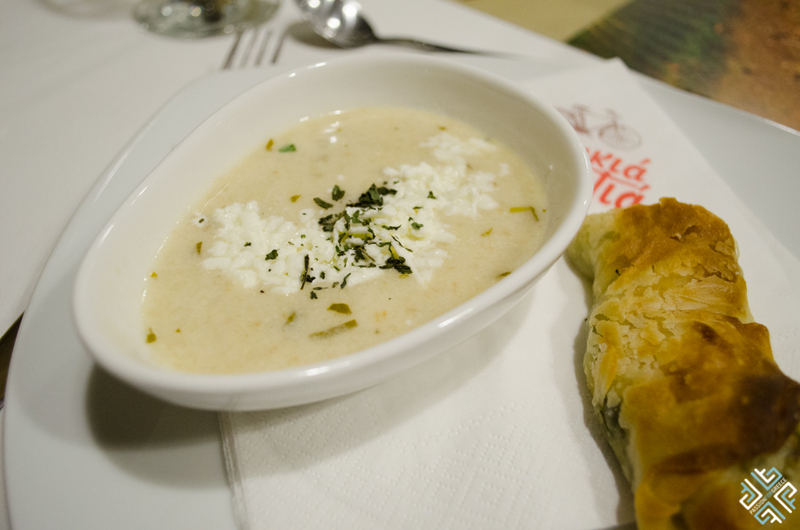 We first had a type of bulgur called sorvas pontiakos with white truffles and a spinach pie. 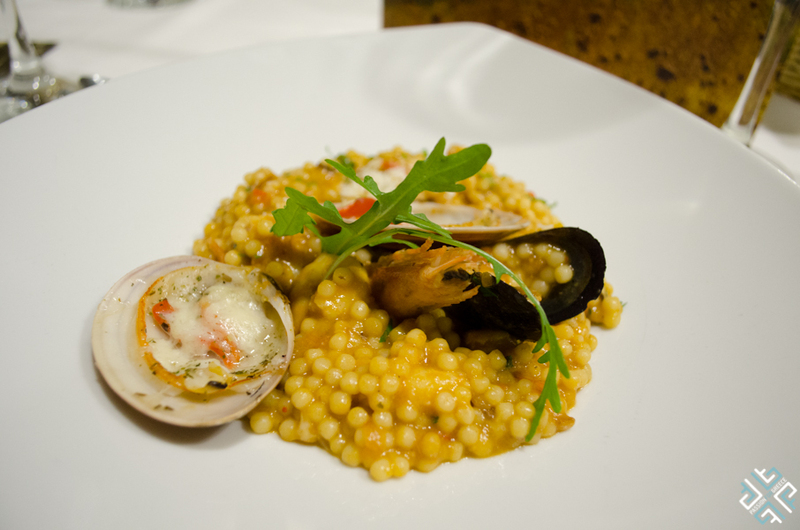 The next creation was couscous with shrimps and mussels. We were then served with a Dakos topped with xinotiri which is a sour white cheese and a spicy tsatsipeli pondiako red tomato sauce with onions. The final dish was black pig which is a specialty of Katerini, served with potato and broccoli purée, poppy seeds and mushrooms. For dessert we had a creamy Greek rice type of pudding with ice cream. 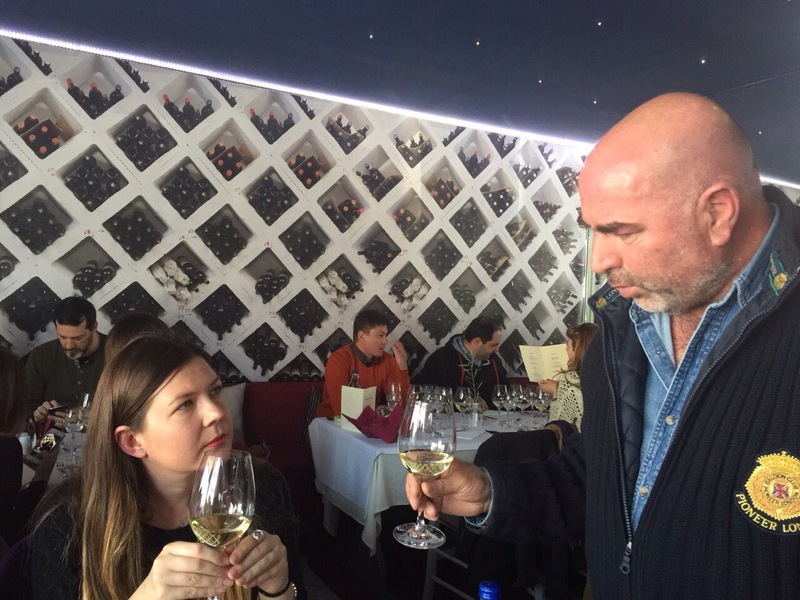 We continued with our wine tasting and were served to try the Euxes Erateines White 2014 which is a pleasant blend of 60% Assyrtiko grape, 30% Chardonnay and 10% Malagouzia. The wine is aged in an oak barrel for 6 months. Up next was the Ktima Xrisostomou dry white wine made of 100% Malagouzia grape. 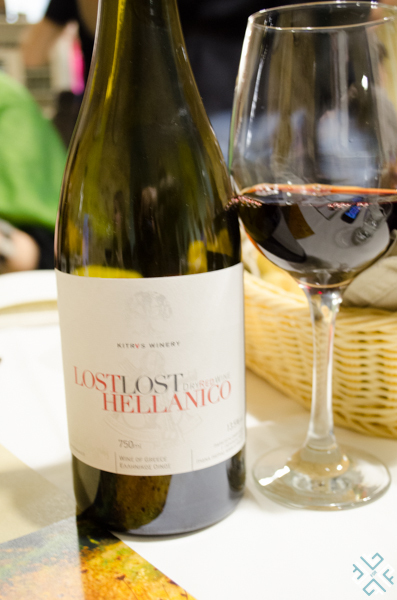 Then came the red wine called Lost Hellanico which is a unique complex wine produced by Domaine Kitrvs in Pieria. It is an ancient Greek grape variety which comes from Italy, mainly from Basilicata and Campania and is aged for 15 months. Its aromas are of ripe cherry, ripe strawberry, prune, cherry, pepper, cardamom, olive paste, cocoa, fresh soil, leather. 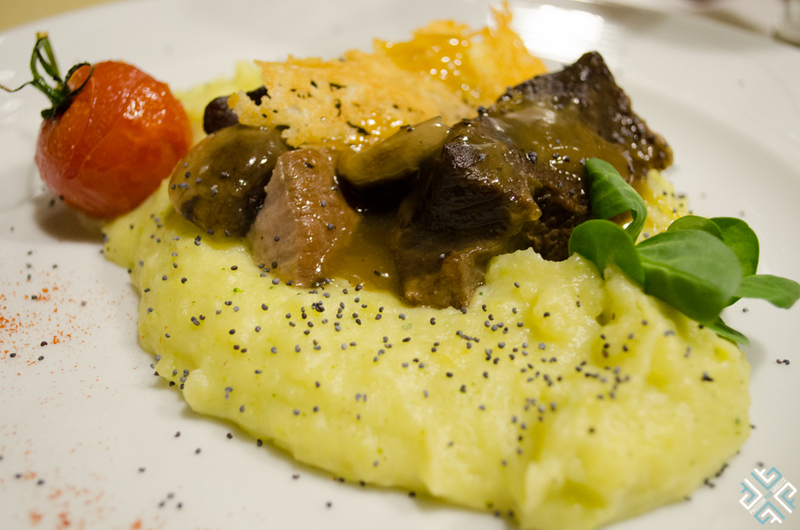 Gastrodromio is a delightful restaurant in the village of Litochoro, located at the foothills of Mount Olympus. The restaurant was founded by Chef Andreas Gavris and has been awarded with the Golden Chef’s Hat Awards in Greece in 2013, 2014 and 2015. It was also included in the Louis Vuitton City Guide 2011. Gastrodromio is a perfect place to treat yourself to a special occasion meal, a unique blend of simple Greek dishes expertly prepared to impress the discerning gourmands. 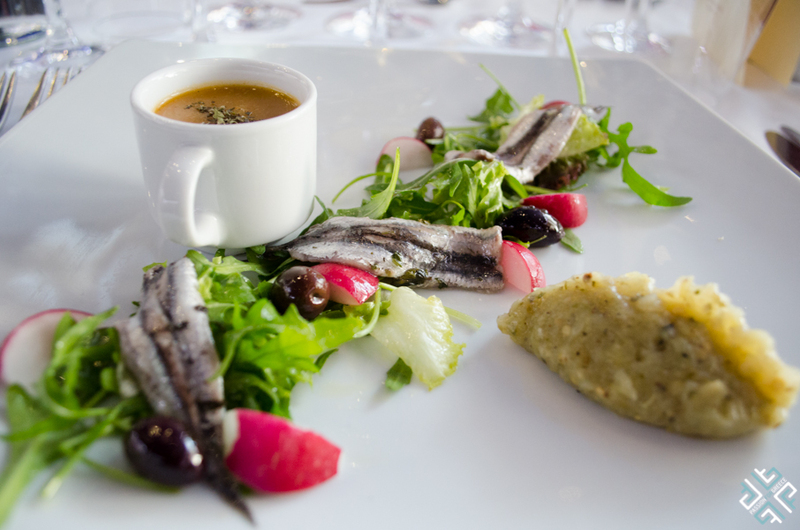 As a starter we were served with a trilogy of a velvety bean soup, rocket salad with anchovies, radishes and olives, and eggplant salad. 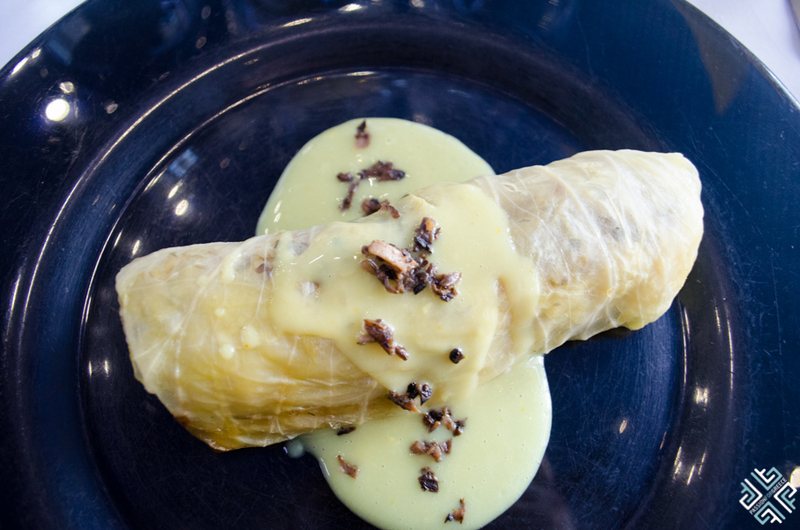 For the first dish we had an exceptional traditional Greek dish known as the lachanodolmades which is also known as dolma, stuffed cabbage leaves usually prepared with minced meat and rice. Yet this was not your ordinary dolmas it was stuffed with bulgur and mushrooms and topped with an egg-lemon sauce with a Greek red saffron or “Krokos Kozanis”. 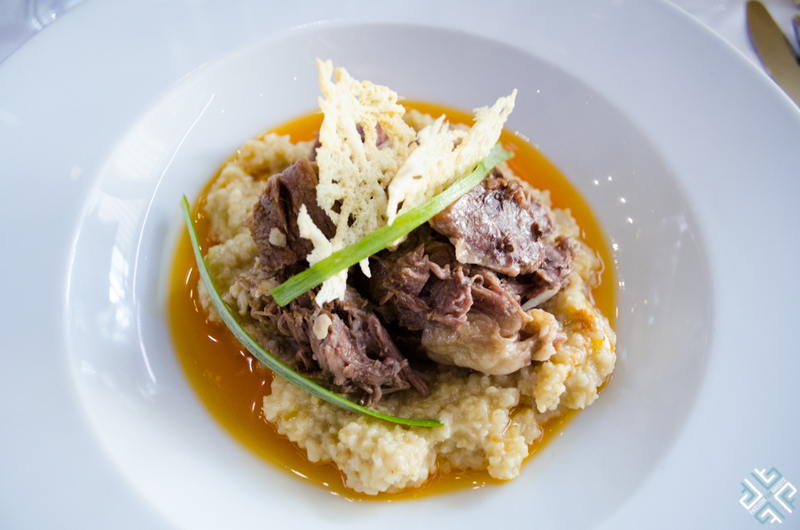 Main dish was an old goat called gida in Greek with trahanas, butter and smoked paprika. 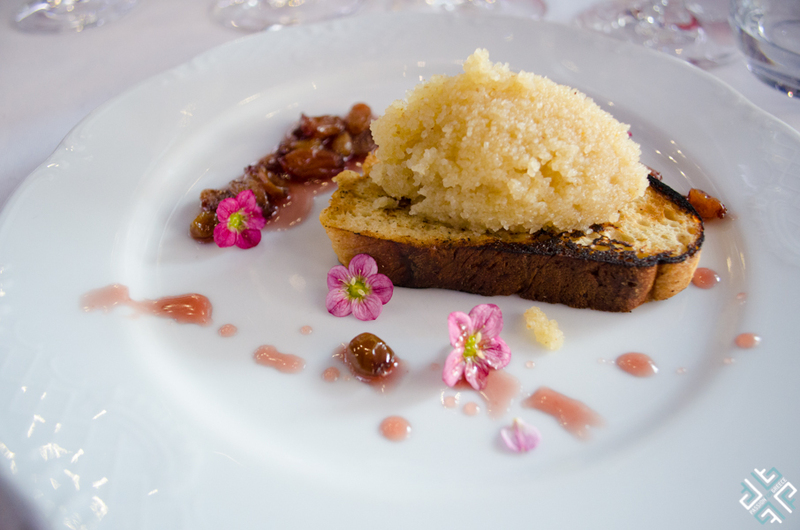 For dessert we were served with halvas which is a Greek sweet prepared using semolina topped with a grape juice and a sweet wine produced by the Papagiannouli Estate. The impressive menu was accompanied by equally impressive local wines. First we tried the Mithiko Vouno which translates as Mythical Mountain a white wine produced by the Estate Grammatosi. A mix of Assyrtiko and Malagouzia grape variety. 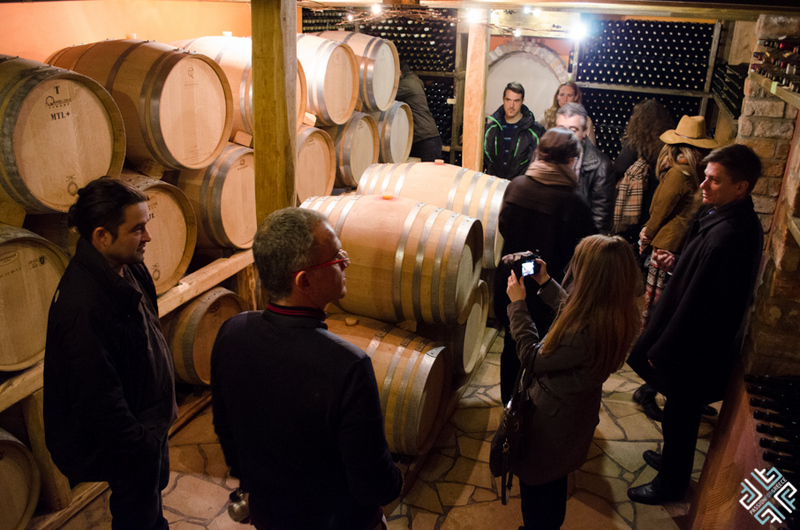 We then had the Trebbiano 2014 which had already tasted at the Kourtis Winery. 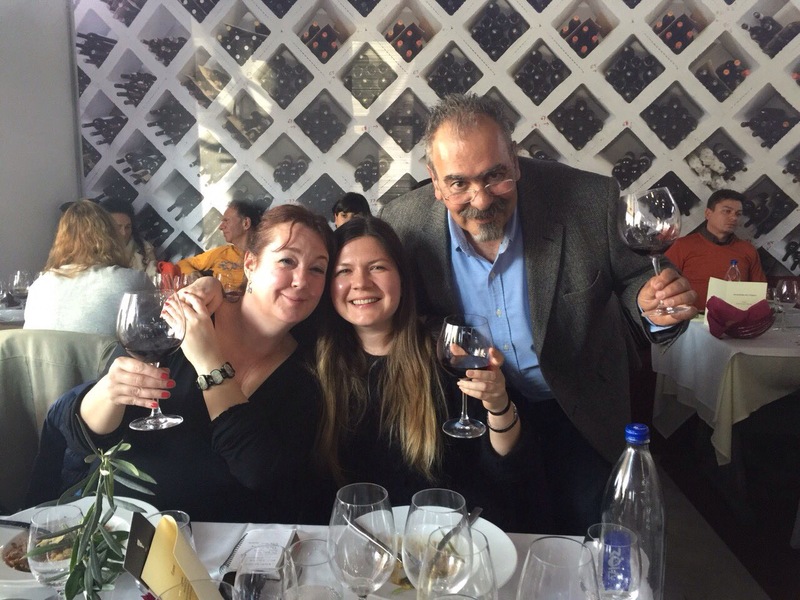 The red wine was by the Pieria Erateini Winery called Eratines Euxes 2013, a mix of Cabernet Sauvignon, Syrah and Xinomavro. Last on the list was a fruity wine by Papagiannouli Winery which tasted like sweet peach. Pieria is a food and wine heaven, trust me.